The following is the text of a speech I gave at the NMRA 2015 Potomac Division 2015 Annual Minicon Meeting. Several people asked that I post the text for their reference. Hope you find it useful. This might seem like a lot of text, but it was just a 15 minute speech. When the Potomac Division asked me to speak at lunch, I said I could do it, but what would they like me to speak about? They said it was up to me. Since I already had a talk planned for that day, I wondered what else I could possibly talk about. Around that time I had been discussing model railroad publishing with a friend. From that evolved the idea of this talk of describing my experience in getting articles and books published. Perhaps it may help you avoid some of the mistakes I made. First thing to remember is that to us this is a hobby; to the publishers it is their job. Most publishers will deal professionally with you and you must do the same. Writing for model railroad magazines is a great way to learn a lot about how publishing works, what it’s like to have your writing edited (check ego at door), and how to improve your writing. Regardless of how many articles I do, I still get a thrill out of seeing my writing published. I think for many of us, seeing your layout on the cover of a magazine is a personal objective. It also can pay pretty well. Most of the big magazines pay about $100 per published page. Others may pay less per page, but they tend to run more pages, so it can end up about the same. Some magazines have a notorious history of not paying their authors, but they tend to go out of business. I know several authors that have been not been paid for their published writing. But so far I have been lucky and have never been cheated. Since I have been writing, the model railroad magazine market has and continues to change. Rail Model Journal, Mainline Modeler and Model Railroading ceased publishing. But there are several others still in business such as Model Railroader, Rail Model Craftsman (under new owners), Narrow Gauge and Short Line Gazette, S Gaugian, Sn3 Modeler, O Gauge Railroading, O Scale Trains, Classic Toy Trains, and ZTrak. N scale modelers currently have two active magazines devoted exclusively to N scale, N Scale and N Scale Railroading. Most of these pay for submissions. There are a lot of other magazines, historical societies, and specialized newsletters that seek material. Most do not pay but they will usually send courtesy copies of the magazine. I have had articles published in the Virginia Train Collectors, and WWI Illustrated that fall into this category. On-line magazines are a relatively new venue. Model Railroad Hobbyist is the leader, but there are several others including O Scale Resources, Trackside Model Railroading, and e-Train. Some pay for submissions, others do not. Most paper magazines also maintain a digital presence. How digital publishing will handle payments to authors, rights to material, and other issues are still being sorted out by the industry. Finally, I should mention there more than a dozen non-US model train magazines. I subscribe to some, but have never written for them. Then there are the model railroad books. As you may know the odds of getting a novel published are vanishingly small. Something like one in a thousand novels that get submitted to agents actually gets published. In the early 1990s my brother and I co-wrote an action thriller novel, Balance of Terror. It got good feedback from readers and the few agents that looked at it, but it generated no interest from publishers. In the end we published it ourselves on Amazon’s Createspace and have sold a few copies. It is still available there if you are curious. It was fun writing it, but it was a LOT of work for almost no monetary reward. Model railroad books are easier to get published compared to novels. But, the sad news is they pay less than the comparable amount of material in magazine articles. They are also a lot more work than similar articles. Although the pay is not as good, there are other rewards. When I do a book I get a sense of accomplishment that is not easily found elsewhere. I do find it fun and interesting to knit together the various elements into a cohesive narrative. I also enjoy doing the research. I learned a lot of about diverse subjects. It also keeps things fresh as it allows me to work on new material. If you want to write a book, you can increase your odds of getting it published by first writing articles. That demonstrates to publishers that you can write, meet a dead line and produce suitable material. Once you have a few articles written, you become a known entity. At that point doing a book can become more feasible. In fact, that is how I got into model railroad book writing. Kalmbach asked me to do the first book. I did not submit a proposal. But they knew of my work from the articles I had written. I enjoy working with Kalmbach Publishing because they are a professional operation with high quality standards. Their books and magazines have great production values. They are professionally edited, and worked over by professional artists and designers. The photos are clear and well printed. The graphics are top notch. They are also nice people. They also take care of the marketing. If you want to make money in publishing, don’t underestimate the importance of marketing. It is big, expensive business. Having self-published a book, I can tell you that the marketing is the most important phase of book selling. You may have the next “War and Peace” manuscript, but if no one knows about it, it will gather dust on your shelf on your hard disk. I am not going to discuss the marketing of the book in detail. If you plan to self-publish a book, prepare to market it. Marketing is tough. Ads are expensive. The Internet can help, but you will end up working hard to get the word out. That is time you can’t spend building models, and writing about them. So I let Kalmbach do it. The trade off is the royalty is a fraction of the book sales, usually around 10 percent of the wholesale price. The lure of self-publishing is that the royalty per book is much higher. However, your sales generally will be less. Most times, your net income is less. The other drawback to self-published books, at least the ones I have seen so far, is that they have lower production values. That means the photos are dull looking, the page layouts are crude, and graphics are rudimentary. Very few of us are all world class modelers, expert photographers, talented writers, capable editors, professional graphic artists, and whizzes at page layout. But self-published books can be very useful for niche topics. For example, a book just about modeling the railroads of the civil war will probably never be published by a major house. I know because I floated that idea and it was rejected by the publishers. But I may still do it as a self-published book. Another good topic for a self-published book would be your model railroad. The late Dan Zugeleter did just that. He wrote a book about his own HO scale C&O layout. He tried to tie in as much prototype information as possible, but in the end it as a paean to his layout. He hired several photographers, including Paul Dolkos and I, out of his own pocket to take the photos. Through pure dint of will he got a publisher to print and sell it, an amazing achievement. Afterwards, the publisher told me he would not do another book like that because it did not sell well. However, a book like that is ideal for self-publishing. Some less generous people call it vanity press. In any case there are no unhappy publishers to deal with. It would be a great record of your work and who knows, it could take off. Just don’t bother with vanity publishers that require large upfront fees. Use Createspace, Lulu or some other on-demand service that only charges per actual printed book. Next I will focus on magazine articles. If you go to the Internet you can find a lot of advice on writing for magazines. But writing of model railroad magazines is a little different than the non-hobby press. Nonetheless there is a lot of overlap in the actual mechanics. The bulk of general magazine writing is done on assignment - this is where the magazine tasks you to do the article. But that is not the case in the model railroad press. While the model RR press does do assignments, and I have been on some of them, most of their articles come from outside contributors. So you want to do an article? The first question to ask is: who is my audience? What publication will use this article? In many ways, writing for the model railroad press is much simpler than sending an article to a general audience magazine, as the subject matter, and the number of magazines is limited. What to write about? We all know the type of articles they are looking for- stories about your layout, how-to describing something you built, layout design ideas, product reviews, and reporting on events that occurred. It helps if your topic is a new or innovative approach that actually works. Next you need photos of that subject, a track plan if it is a layout, and text. In this business, the story is important but good photos are the key. Good photos will sell the story, especially for a layout feature. How to take good model railroad photos is the subject for another long talk and I won’t cover that here. See this link for more info about model railroad photos. If the magazine likes your story, but the photos are inadequate, they will send a photographer to shoot new images. But if they do that, the photographer gets the bulk of the payment and you will get a token amount. I know several layout owners that were disappointed by how little they got paid for an article about their layout where the magazine sent a photographer. If you go that route it is best to discuss with them up front so no one is surprised and or disappointed. With regard to subject material, whatever it is, it has to be well executed. Doesn’t matter if it is a beginner oriented piece or a description of your world class scratch built model. Models should be carefully assembled without obvious flaws like glue globs, fingerprints, wheels off rails, covered in dust, or cat hair. Generally speaking you should weather your models realistically, and paint your track. I had an editor ask me to reshoot a layout because the rail in the track in a few scenes was not painted. Nowadays, I could do that in Photoshop, but this was in the 35mm film era. I did the reshoot and the article was published. One other word about subject matter- most of the magazines are very scientific about the mix of articles they publish. They try to cover the various scales and topics in proportion to their readers’ interests. The majority of modelers do HO, so that gets the most coverage. Most multi scale magazines end up with an oversupply of HO scale material. But they have a dearth of N and other scales. An article depicting a well done N Scale topic is more likely to be published, then an comparable HO article. On several occasions editors have called me looking for N Scale material. If you really want to get a start in model railroad writing, do something well in N scale and write about it. And if the general magazines reject it, there are two N scale magazines that need good material. If you do a layout piece, you will probably need to do a track plan. It must be clearly drawn to scale with minimum radii and turnout size indicated. It can be a rough draft. It is not necessary for you to hire an artist to draw a track plan. The magazines have art staff that will re-execute the drawings to their standards. But if you can draw a plan that is “camera ready,” that helps your odds of getting published. I won’t discuss much the actual writing as frankly, it is not as important in model railroad articles compared to the photos. Their editors will rewrite and polish the text. Nonetheless, make the writing as good as you can make it. The easier you can make the editor’s job, the more likely they will publish it. While grammar and spelling are important, properly organizing your text so that the material flows logically is far more important. Regardless of what your article is about, it should tell a story. That is where the craft of writing comes in. Don’t send in too much material. It is your job as the writer to cull through the reams of information you collected to make an interesting and compelling story. These are not technical journals, nor Pulitzer prize investigative reporting. These articles are a form of entertainment. Be as concise as possible. Make the editor’s job easier and you’ll both benefit. Do not be unwilling to accept editing. There are times when you will be asked to cut your carefully composed text. If they ask you to do it, do it. Otherwise they will, or worse, they won’t publish it. If you have the opportunity, you might want to allow a friend or a fellow writer to read your article and give you feedback. I have a niece with a degree in technical writing and I pay her to review my book manuscripts. It is not necessary, but it makes my submission look better, and she gets to list it on her resume. One you decided what to write about, you now get into the mechanical process of submitting the article. First, check with the magazine to learn of their writer’s guidelines. Almost every magazine has guidelines for their authors. Many are available on line. The guidelines cover text and photos. Guidelines for books may be different than articles. After reading through the guidelines, you should comply with them. Does the publication accept query letters or prefer full manuscripts? What's a query letter? A query is a single-page letter which sells your story idea. You don't write the entire article--only the first paragraph which captures the reader's interest. Then you describe the article and timeline. If you get interest from a query letter, if behooves you to follow through and do the article, at least if you want to establish a good reputation as a writer. I personally have never written a formal query letter for a model railroad article. The first couple articles I did, I just sent the article in with photos, etc. Later, the editors would email or call me with suggestions and ideas. But I have heard of some folks going the query letter route. I have done book proposals and even a project layout proposal. One caution, you should not send the same finished article to several publications at the same time. It might be OK to query different publications at the same time, but never send finished articles on similar material to multiple magazines. You have to submit to one magazine and wait to hear one way or the other. Most will usually let you know right away if they are going to use it or not. Some will pay for the article in advance. Others pay upon publication. In either case, you are locked in, even if they don’t publish for several years. Sometimes they change their minds and will never publish the piece. In that case you have an option of buying back the article and trying to get another magazine to publish. If a magazine is holding on to an article and you want to do another piece with similar material, you should discuss your plans with them. I suspect they would be happy to work something out with you. If you get rejected, don’t feel bad. As it is in dating, rejection is common for writers. You’ll have to be ready to accept it. There are many different reasons for rejection some of which are out of your control as a writer. Sometimes your article was rejected due to bad timing because they already purchased or plan an article on that or a similar topic. In the rejection letter they may tell you why. Sometimes they will reject the article but give suggestions for a new or related idea. The final step is to submit your material to a publication. The publisher’s guidelines will explain what you need to do. Most accept digital files along with a paper copy. Also realize that there is usually a long lag from when you submit to when it gets published. You have to be patient. Finally, be courteous and use common sense. I worked on a bunch of different tasks tonight including a talk scheduled for next Saturday at the the Potomac Division Minicon, shipped some products for Alkem Scale Models, ran the spin caster for an hour making parts, and finally did some work on the superstructure for the ships on the layout. I reworked the bridge valance parts, and added home-made some hand rails to the superstructure. The Anna Marie kit comes with etched handrails, but for this model I opted to make the railings from 0.020 inch phosphor bronze. I elected to do this because the phosphor bronze hand rails can be soldered and are much stronger than the etched parts. I also thought some more about making the Anna Marie longer. The middle photo shows the kit hull with an HO Genset loco and a Ford Explorer. The idea is to make the ships dominate the trains. Thus I plan to lengthen the ship. The ship needs to be bigger to dwarf the trains. With a beam of 7 inches, extending the Anna Maire hull from 39 to 50 inches is very much within the realm of feasible. Seagoing ships have L/B ratios of around 7:1. For example the BBC New York class ships are 130m long and have a 16m Beam. That works out to 58.5 inches long and 7.2 inches in beam in HO scale. That generates a L/B of 8.1. I think the best approach to lengthening the hull is to cut off the parallel mid body and fabricate new parts on the laser. That way I can add the scupper and other holes very precisely and easily. Those parts are essentially flat panels. The bulwarks on the kit require a bit of work in filing and sanding, so getting rid of as much of the kit bulwarks as possible will make for less sanding. I still haven't decided what to do about the second ship planned for the scene. 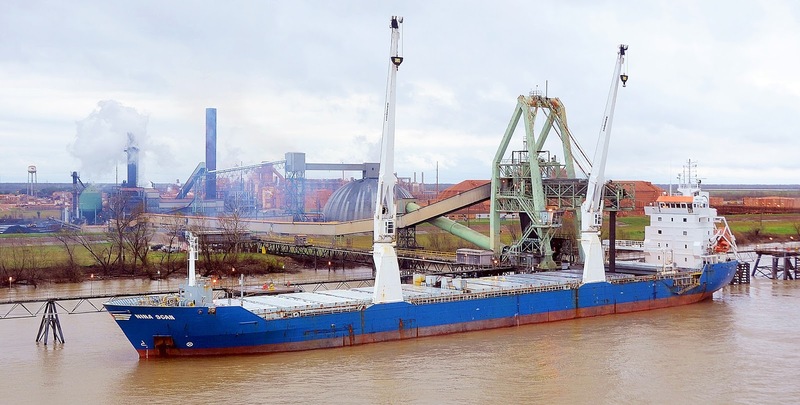 I may use the Anna Marie at the grain elevator and make a larger ship at the Harbor Island wharf, perhaps using the half hull concept. Randy as brakeman is dealing with the link and pin couplers, while engineer Jim seems to be enjoying the show. This evening Jim Dufour and Randy Laframboise visited the layout. They are two New Englanders on a tour of layouts in Northern Virginia and Maryland. Both Jim and Randy have fine HO scale layouts. Jim models the B&M Chersire Branch, Randy models the Rutland. You can find some videos of Jim's layout here. This afternoon they visited Paul Dolkos's Baltimore Harbor. After steak and beers at Hops, they toured the USMRR Aquia Line. They got a chance to run the RR and do some switching. They were also the first outsiders to get a view of the upcoming HO harbor layout. It was a fun visit especially since the Aquia line ran without mishap. After having dinner with my mom, I stopped by Home Depot on the way home to pick up some materials to continue testing benchwork designs. I got a couple sheets of 1 inch foam and some premium pine 1x2s. Various models from my collection used to mock-up the benchwork. I used the 1x2s as stringers supporting the 1 inch styrofoam base. I clamped some scrap 1x2s to the legs of the Ivar shelves. The resulting benchwork was very stiff, especially the long span across the top of the TV where there will be 4 feet without any legs. As I examined the benchwork and its interaction with the TV and shelves, I realized that I could drop it by the thickness of the 1x2 stringers. I was concerned with the benchwork interfering with the TV screen, but when viewing the TV from the chairs, the slight lines are not blocked. In fact, the lower benchwork makes the underside of the layout harder to see. The lower benchwork is desirable as it means I can more easily add a track under the stairs to make a fiddle yard. In looking over the rest of the space, I ruled out the optional location of the staging track along the stairs. That was just not going to work. If I want to use off layout staging, it will have to be in the closet. One objective of this harbor layout is to show how the ships dominate the trains, To that end, I would like to have larger ship models, or at least one large ship on the layout. I revised the drawing slightly to allow for a larger (wider or beamier) ship at the pier. However, some on-line research found some multipurpose cargo ships that are longer than the Anna Marie, but with the same beam. Adding a nine inch extension to the Anna Marie would be easy. That brings Anna Marie up to 106m in prototype length. I also drew a half hull 140m ship to see how it would look. This would be a scratch build model, but being only a half hull, and waterline model would be much easier to make. It might be just as effective as a full hull in this location. It is worth investigating. I plan to do a more detailed mock up of a half hull to see how it looks. Half hulls are very common in ship modeling to show hull features. They usually don't have deck fixtures or rigging detail, but this model in the photo below shows how one such model would look. I moved the books and toys from the old shelves to the new shelves, and then took down the old shelves. Next I installed some grid benchwork sections from McCook's Landing to mock up the new layout. To continue the mockup, I put some kits on the benchwork to better visualize the major elements of the layout plan. The hull is from Dean's Marine Anna Marie kit. The crane is a HO scale die cast model of the Liebherr 500 mobile harbor crane. I also put one of my O scale building mockups on the layout to simulate the transit shed. The foam piece on the right is my Ft Hood diorama, which I will disassemble and recycle to this layout. A couple things pop out from this test mock up. First, my wife was surprised at how well it worked out. She was worried that I was cramming too much stuff down there. Well, yes, I am, but lets move on. Second, the Deans Marine kit, at 39 inches long, looks a bit small in that space. I may have to rethink which and where I put the ships. The ships do not need to be fixed in place, it is is conceivable that I can build different kinds of ships that vary between op sessions. 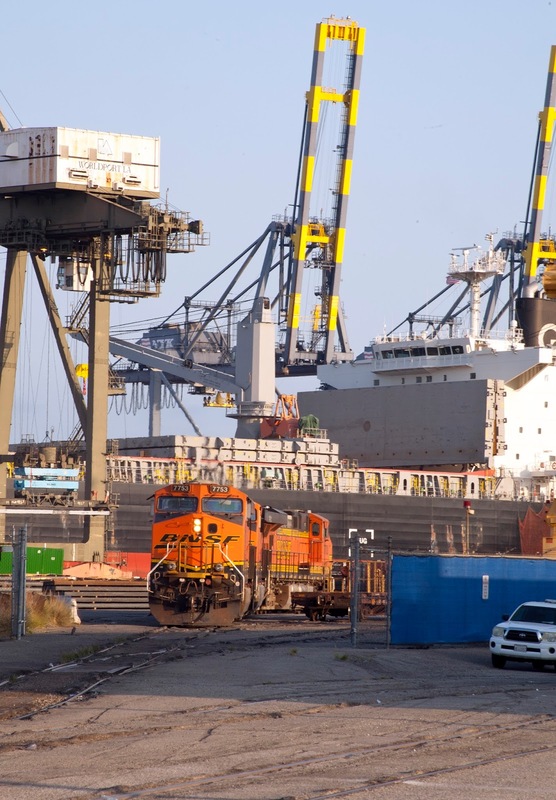 For example, a heavy lift ship for wind mill parts, then a Ro-Ro for vehicles, barges for bulk materials etc. Adding a few inches of depth to the wharf area benchwork will not be a problem. Third, there is space on the far left to add a small peninsula extending along the stairs. If I put the fiddle track there, I can avoid having to cut holes under the stairs into closet. Since this is not intended to be a permanent layout, that might be a better idea. This would also allow a more accurate rendition of the actual track plan as the track can angle out to the fiddle track as in the prototype. Here are some Google and Bing maps views of Beaumont. tanks off the flat cars. I need to verify that. Overview of the area to be modeled. This photo shows the area before the new storage yard was constructed. I have used Ivar shelves from Ikea as model railroad benchwork under the part of Aquia Landing of my O Scale layout that is in my workshop. It is the perfect height for my benchwork. I decided continue to use it for the benchwork under the new modern harbor layout. 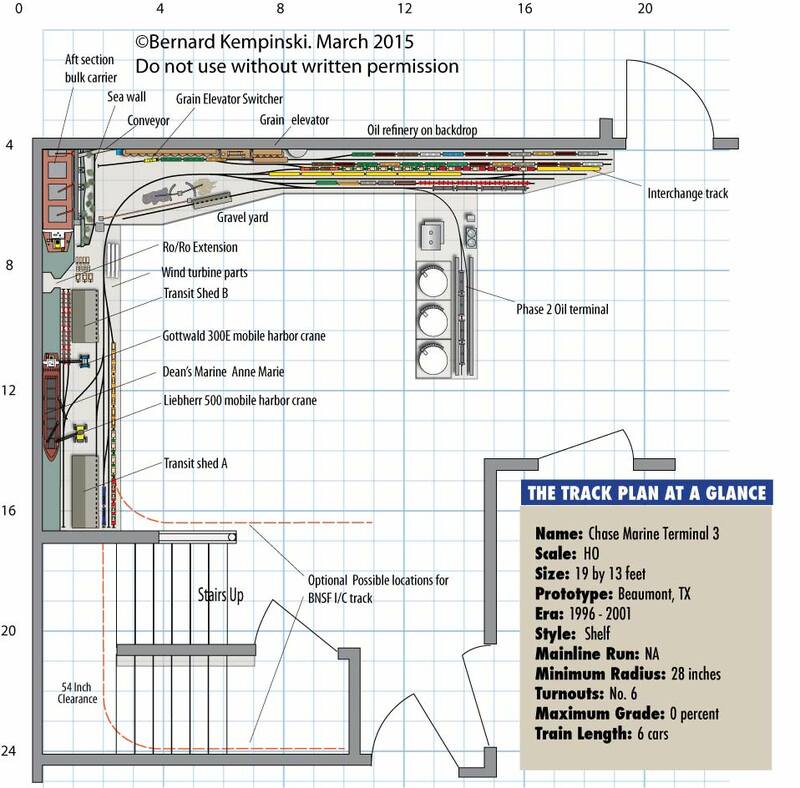 I want the track level no higher than 51 inches, as this will allow me to run a track under the stair landing to staging, if I decide to do that. It is also the height of Aquia Landing track, leaving me the option to extend Aquia Landing in the future. The trick here is that the new smaller TV is 48 inches high at the top edge. So any layout fascia can be no wider than 3 inches, at least as it crosses the TV area to avoid interfering with the image on the TV. Note this is assuming I continue to use the TV stand seen in the image. I would prefer not replacing that as it in good shape and works well. Instant Ivar benchwork. The picture frames will be removed and the walls painted sky blue. I will probably go with a black fascia for this project. Why use Ivar? I compared the price of the Ivar shelves with home made plywood shelving. The Ivar was much less expensive and easier to build. For use in this part of the room, which houses a TV, stereo and several display shelves, I decided to stain the vertical members black. I will leave the shelves natural wood. The Ivar pieces are somewhat raw when they come from the store and need some finishing for use in a finished room. 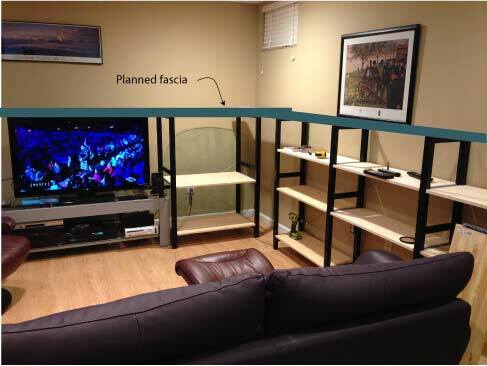 The new shelves will be expand the amount of shelf storage in the TV room by about 250 percent. This will allow me room to display some of my dioramas and small collection of Porsche race car 1/43rd scale models. I used Miniwax Pre-Stain Wood Conditioner (water based) on the uprights. Then I applied Miniwax Polyshades Black Stain. This later product is not water soluble and needs about 6-8 hours to dry. Once I have the shelves completed, I will add a layer of 1x2 grid benchwork screwed to the Ivar legs. On top of that will be 1 inch of foam and a layer of 1/8 inch plywood under the track. The 1/8th inch plywood is soft and can be spiked. Implications of Keep Alive Circuits on Layout Design-Having Cake and Eating it. I have been a big proponent of simplification in model railroading. My own home layout while a daunting project due to the scratch building involved, is a rather simple track design mostly because I wanted to avoid electrical complexity. Technology is finally coming around to address some of these concerns and it has an effect on layout design. Lets trace the history of frog power and electronics using my layouts as an example. To me the absolute least pleasurable task in model railroading was connecting switch motors to turnouts to actuate the points and electrically power the frogs. Because I use relatively small 4-4-0 engines, powered frogs were a must. Clean track is also required to allow uninterrupted power pickup. At Falmouth, the first section I built on my O scale layout, I used home made mechanical devices to electrically power the frogs. To actuate the turnouts, I made scale sized switch stands. The separation of mechanical actuation and electrical power was a step in the right direction, but still required a lot of uncomfortable under table work. As a bi-focal wearer, this is problematic as the normal angles of view in this work are not where the close vision lenses lines of sight are. Before wiring the next section of the layout I discovered Tam Valley Depot's Frog Juicers. I blogged about them earlier. They are an elegant solution that uses complex circuitry to make a very user friendly and easy to install way to power frogs. They worked perfectly right out of the box and I was able to quickly wire the remaining turnouts on my layout. The prices was also pretty reasonable, about $16-$17 per turnout. While these solved the frog power issue for my O Scale layout, I still had intermittent electrical pick up issues to deal with on the locos. 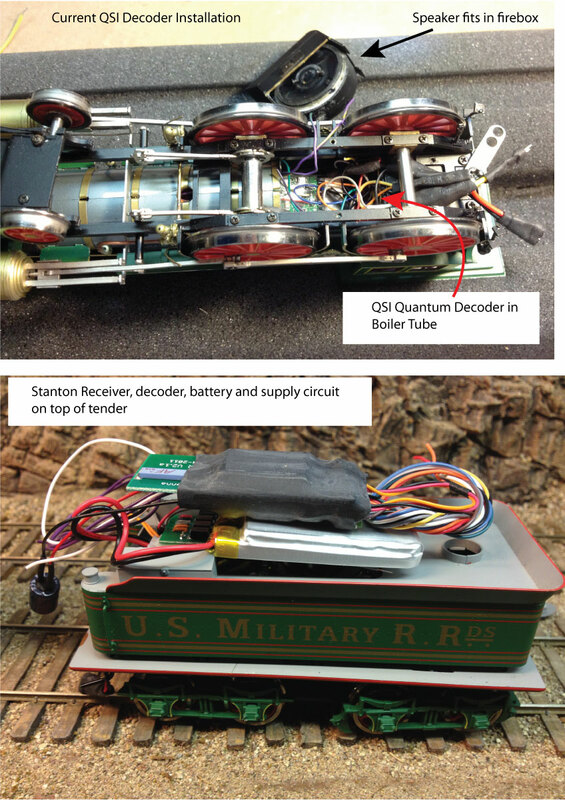 The Stanton Battery Power system came along and addressed that problem. The Stanton system is perfect for a simple layout like mine. The main problem was finding space in my locos to house the decoder, speaker, batter and battery power supply. I had so far successfully converted two of my locos and they have been giving good service now for about three years. At this point, my O scale layout has a mix of DCC power via the rails and battery power, also recharged through the rails. As I finish the layout at Aquia Landing, I plan to continue to follow this approach. I also planned to use that same approach on the HO layout I am building for my next book. To keep the HO project manageable I decided to go with a plan that included 10 turnouts with frog juicers and a fiddle yard to do staging. I mentioned this new layout with Paul Dolkos as I was seeking his advice on what HO scale track he recommended. He suggested Micro-engineering track as it looks the best, and their turnouts have integral point mechanisms. He also shocked me when he said that he does not power his frogs. Now, I have operated his layout many times and it runs nearly flawlessly. I had no idea. All my previous experience in N and O scale indicated that powered frogs were a prerequisite. How can this be? He usually runs single or multiple diesels with all wheel pick up. Since he keeps his rail and wheels clean, the engines can usually bridge the dead frogs. As our discussion continued, Paul brought up the fact that DCC engines now have keep alive circuits that can bridge short sections of dead or dirty track. I had heard about these, but had not previously thought about them much. A light bulb went off. I realized that if a layout can built without worry about powered frog and mechanical switch actuation, my two least favorite activities in model railroading were eliminated. Then it occurred to me that the design of the layout can change too. Without all the electrical constraints, more complex track plans can be more easily attained both in terms of dollar cost and effort. Instead of powering every frog, one just needs to install keep alive circuits in each locomotive. The keep alive circuits cost about as much as a single frog juicer, so there is a trade off one needs to examine. If you have a big collection of engines, but not so much track, it may be less expensive to power the frogs. In the case of my HO project layout, I will have a small number of engines, so adding the keep alive circuits will be less costly. Furthermore, installing the keep alive can be deferred until actual testing shows that it is needed. Remember Paul's layout runs fine without them. Under this new approach, but still with the same philosophy of simplicity, I redesigned the HO layout to have about 20 turnouts. Instead of a fiddle yard, where cars would have to be man handled during an op session, I added a visible staging yard. This opened up increased operational possibilities too. Now the grain elevator could be a working switch job on the layout. Without the need to purchase frog juicers, there was not much cost increase for the expanded plan. 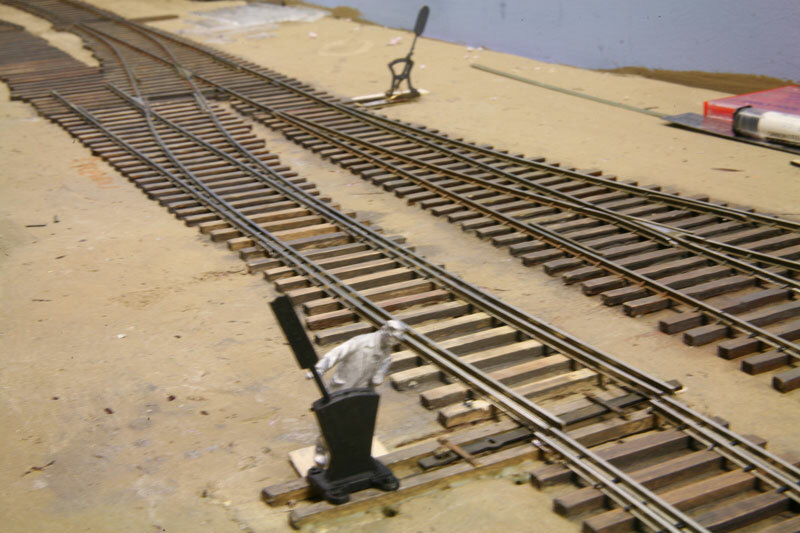 Using flex track and Micro-engineering turnouts, while not as simple as a building a Brio layout, will be much faster than hand laying track. This is looking like a win-win (except for Tam Valley, sorry Duncan). Now the next step is to try installing some keep alive circuits on the engines. I would be happy to learn of my reader's experience in this regard. Have you done any of these? How tricky was it? I see that some DCC decoder manufacturers are building keep alive in their decoders. Can anyone share their experience with those? Several of you have noted that I have not made much progress on the Aquia Line lately. Yes, it is true that other projects have bumped it back, but I do intend to finish it. Keep reading to see why. I recently started working on my next book for Kalmbach. That book will include a couple projects including a brand new layout. 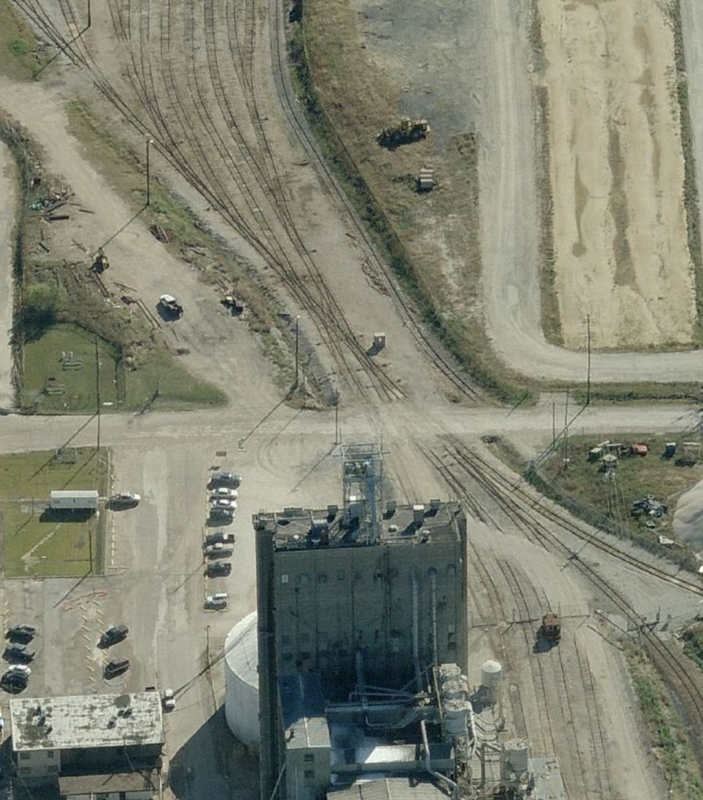 That layout will be based on a modern harbor, probably based on Beaumont, TX. I selected Beaumont for several reasons, first I wanted a topic that was manageable in that I could build it less than a year. Beaumont is a major port, but it is composed of many discrete elements. Picking a piece to model was not easy, but it was fun. Second, I wanted a port that shipped military vehicles. Beaumont is a major destination for US Army military shipments. This will allow me to use the DODX cars I am developing in an actual layout. Since those are HO cars, it has to be an HO layout. That ties in with my plan to develop more HO kits for Alkem Scale Models, so this layout provides a test bed for developing new products. Finally, I want the layout to provide some interesting operations. Looking at the prototype plan you see some very interesting track work. The track work in between the transit sheds at Harbor Island includes four diamond crossovers. and at least one double slip switch. Last weekend I had a chance to operate on Paul Dolkos's new Baltimore Harbor Layout. I worked the B&O Carroll Street job. That job operates over an area about 1.5 by 12 feet long. There was plenty of thought provoking switching operation in just that area. That reinforced my belief that a small harbor switching layout in a similar footprint could be fun to operate. 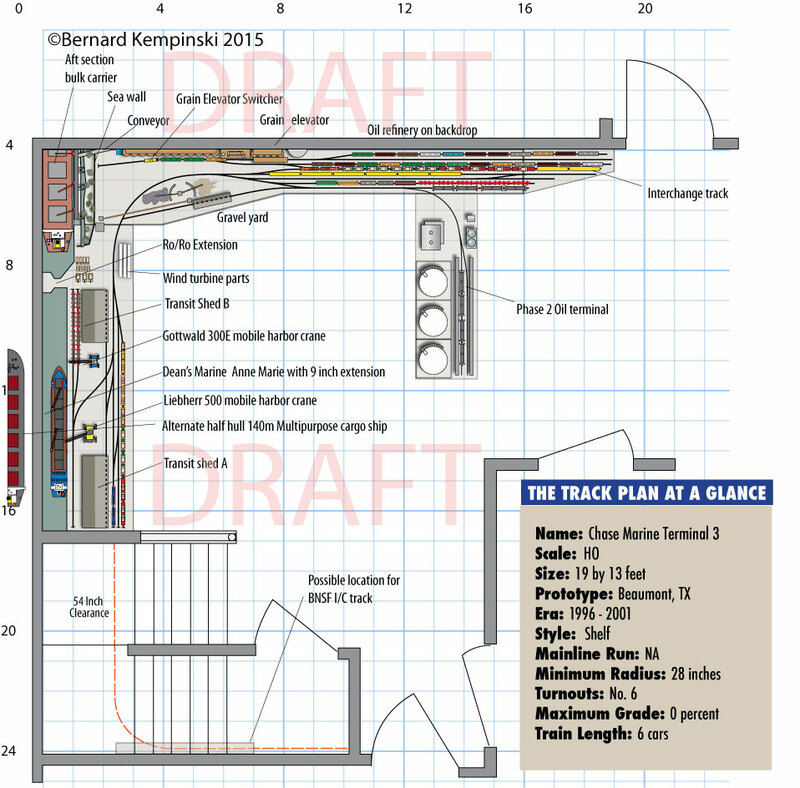 Here is a draft track plan I envision of the project layout. It uses the recycled benchwork from McCook's Landing, along with a new extension on the left wall. Under this extension will be new bookshelves. The Phase 2 oil terminal will be built later, as it is not needed for the book, but does add an interesting industry to operate. It can also be made removable, even as a FREMO module. 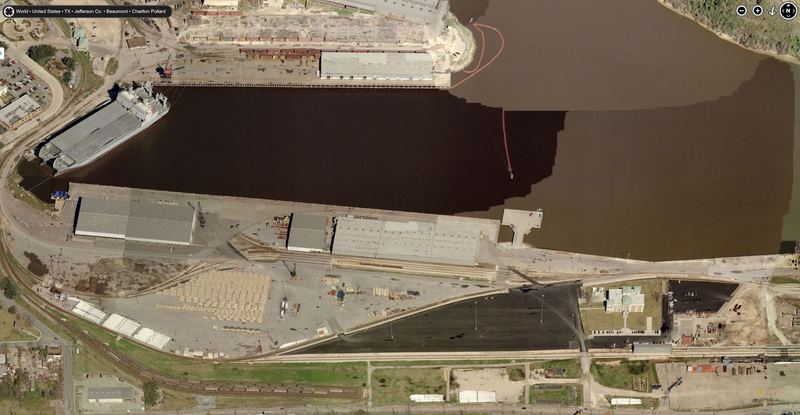 I call this layout Chase Marine Terminal 3, since it is freelanced, but it is based on selectively compressed areas the Harbor Island and Carroll Street sections of Beaumont. This will be the third iteration of Chase Marine Terminal. The first two were N Scale. For now, I will not discuss this layout plan much except to ask that any readers that know about this area, please let me know your thoughts or comments. I would like to learn a little more about how the railroads work this area. I will also tap my network for suggestions on DCC, rolling stock etc. This is a first major foray into an HO scale layout and I am very excited about it. But, I am not that familiar with all the HO stuff available. I plan to include discussion of the port layout on this blog, since I did not feel the extra work of a second blog was worth the effort. It will focus on aspects that will not be in the book. Things like DCC installs, loco repaint, etc. So what does this have to do with Aquia Line except provide more distractions? As part of this next book, I also intend to complete the wharf at Aquia Landing as project. So I will be working on that too (among other projects). See - Convergence. I had a chance to fire up the vulcanizer and spin caster this evening to try making some metal parts. A few years ago, Eric Cox, of Panamint Models, made some O scale truck parts for me in Shapeways. Our idea was to try using the 3D printed parts as masters in my vulcanizing mold machine. The first attempt was somewhat successful, but some adjustments were necessary. So Eric redrew the parts and set me a revised set. In the meantime, I figured out that the silicone rubber mold material I had was beyond its shelf life. Thus the rubber would not vulcanize properly. So I ordered a new set of rubber mold blanks. This time I ordered a low temperature silicone rubber that cures at 190F. These are intended for molding 3D printed masters and other low temperature materials. The drawback is that the silicone rubber is not as strong as higher temperature rubber. I put the revised trucks in the mold. I also put some of my 3D printed DODX brake detail parts in the mold. Shapeways has been somewhat unreliable lately. The have been shipping the parts after months delay or outright canceling my orders. So I though it would be prudent to make metal copies of the brake details. The low temp rubber worked well with the 3D parts. The molds looked good. I cut the gates in the parts and started spin casting. As normal, the first couple pours did not work too well. But as the mold warmed up and I added some gates and vents, I got a pretty good yield. After about 25 pours the mold started to deteriorate. The brake details came out very well. The truck parts had a lower yield, but I still got a pretty good set of parts with which to experiment. The rubber mold material in the axle holes and some other spots that had undercuts had problems with tearing after a few pours. I assembled a truck using some of the new castings. The revised design has very close tolerances. That combined with some deteriorated axle holes, meant that I had to do some grinding and filing to get the parts to fit without interfering. The wheel sets seemed to spin smoothly, but in testing on the track I noticed some sparking due to shorts. I added some 0.010 inch styrene shims to insulate the wheels from the side frames and that worked to remove the electrical shorts. The cast metal trucks don't have working brakes. But they do have some nice detail. The cast trucks add weight down low, so they should help the cars track better. Given I have to fiddle with them to get them to work well, there isn't too much labor saving. So the jury is still out on if I want to do the rest of my cars with cast metal trucks.